Melbourne-based percussionist Kaylie Melville is a soloist and chamber musician dedicated to new music performance. Noted for her “extraordinary ability to impart a sense of musicality to even the smallest gestures” (Partial Durations), Kaylie is a core artist with new music pioneers Speak Percussion, a co-director of the contemporary ensemble Rubiks Collective and frequently works with leading Australian ensembles and orchestras. In addition to performing, Kaylie's practice incorporates improvising, directing, curating and teaching. As a passionate advocate of new music Kaylie has performed in the world premieres of major Australian works, including Kate Neal's 'Semaphore' (Arts House 2015) and as the percussion soloist in Jack Symond's 'Double Purity' double concerto (BIFEM 2016). Her festival appearances include the Metropolis New Music Festival, Bendigo International Festival of Exploratory Music, Melbourne Festival, Adelaide Cabaret Festival, Salihara Festival (Indonesia), and the Percussive Arts Society’s International Convention (US). Kaylie has also participated in a number of prestigious new music courses including the inaugural Eighth Blackbird Creative Lab (USA, 2017), Darmstadt Summer Course for New Music (Germany, 2016), Bang on a Can Summer Festival (USA, 2015) and So Percussion’s Summer Institute at Princeton University (USA, 2013). Recent awards include an Ian Potter Cultural Trust Grant for study in the US, an Australia Council ArtStart Grant, the University of Melbourne’s Professional Pathways Scholarship, and the Australian National Academy of Music’s John and Rosemary MacLeod Traveling Fellowship. Kaylie was Speak Percussion's Young Artist in Residence in 2014, was selected as a finalist in the ANAM Concerto Competition in 2015, and was a finalist for the Freedman Classical Fellowship in 2016. In November 2016 she was featured in ABC Classic FM's '40 Under 40' as part of Australian Music Month. Kaylie is currently the coordinator of Sounds Unheard, Speak Percussion's education program for gifted and talented secondary music students supported by the Department of Education and Training. She has worked as an instrumental music tutor, ensemble director and conductor, and currently teaches percussion and drum kit lessons through a private studio. 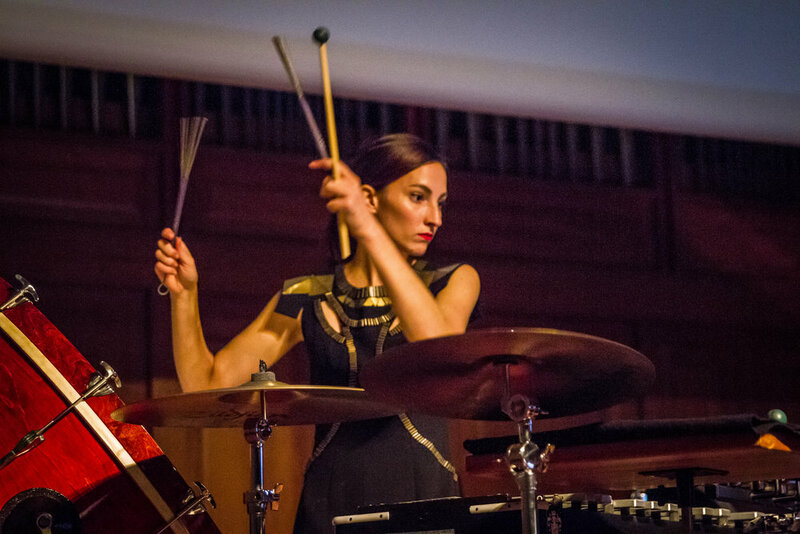 Kaylie was one of the first percussionists admitted to the Professional Performance Program at the Australian National Academy of Music, and holds Master of Music (Research) and Master of Music Studies qualifications from the University of Melbourne. She completed her undergraduate studies at the University of Western Australia, where she earned a Bachelor of Music (Honors) and a Bachelor of Arts with majors in French and English Literature. Her teachers have included Peter Neville, John Arcaro, Robert Cossom, Tim White and Alex Timcke. Ian McCollum, Bryony Jackson, Daniel Pufe & Chris Bennett.